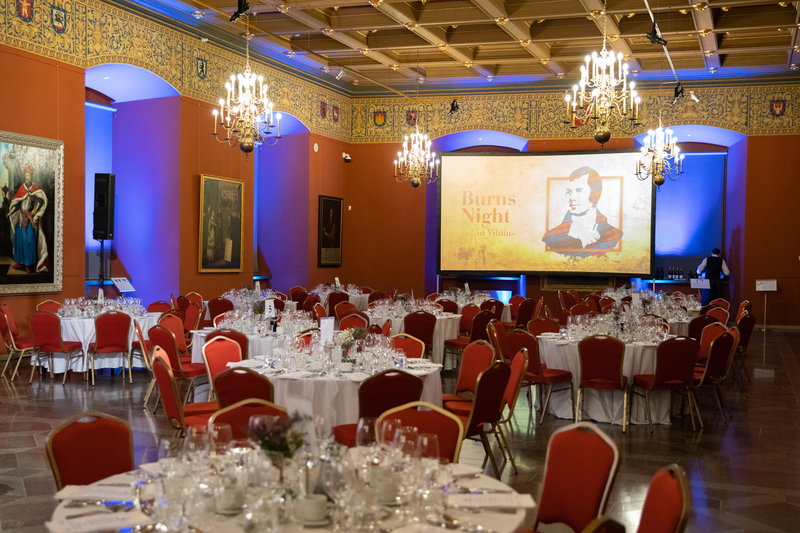 On 26th January 2019, the British Chamber of Commerce in Lithuania were organising its 20th Burns Night in Vilnius to celebrate the birthday of the Scottish national poet, Robert Burns (1759 – 1796) and to raise for local youth & children charities: Charity initiative ‘Happimess’ supporting kids with oncology diagnosis and ‘Youth Line’, emotional support hotline. 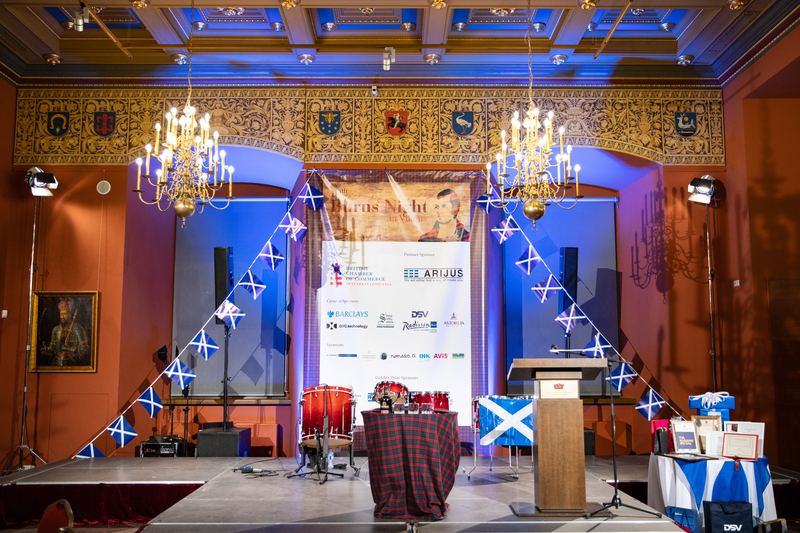 The event in Vilnius also marked 20 years of continuous promotion of Scottish traditions and culture in Lithuania and was held in two venues: Vilnius – Palace of the Grand Dukes and followed in Grand Hotel Kempinski Vilnius. 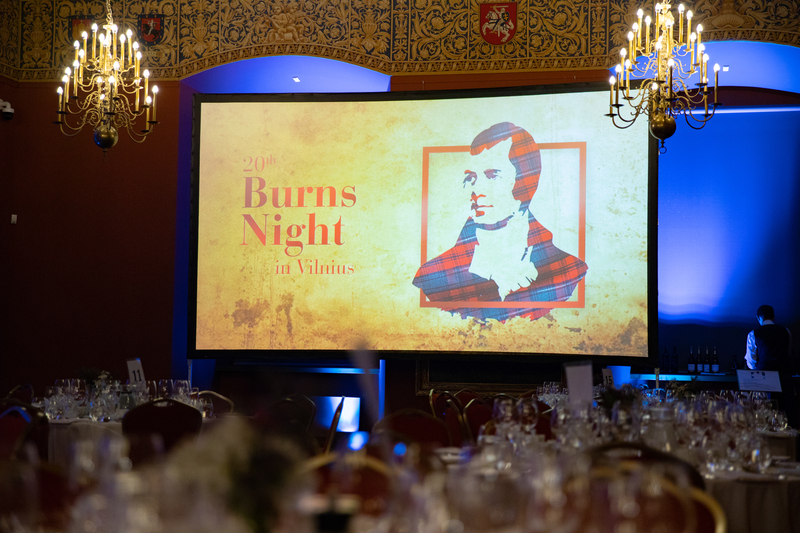 Burns Night in Vilnius is the most popular annual charity event of the British Chamber of Commerce, each year attended by nearly 300 guests including CEOs of Lithuanian, British and International companies in Lithuania, members of Lithuanian Government, diplomats and guests from Scotland and England. The event receives significant coverage in the national press. The photos from Burns Night in 2018 can be seen HERE and HERE. The photos from 20th Burns Night can be seen HERE, HERE and HERE. 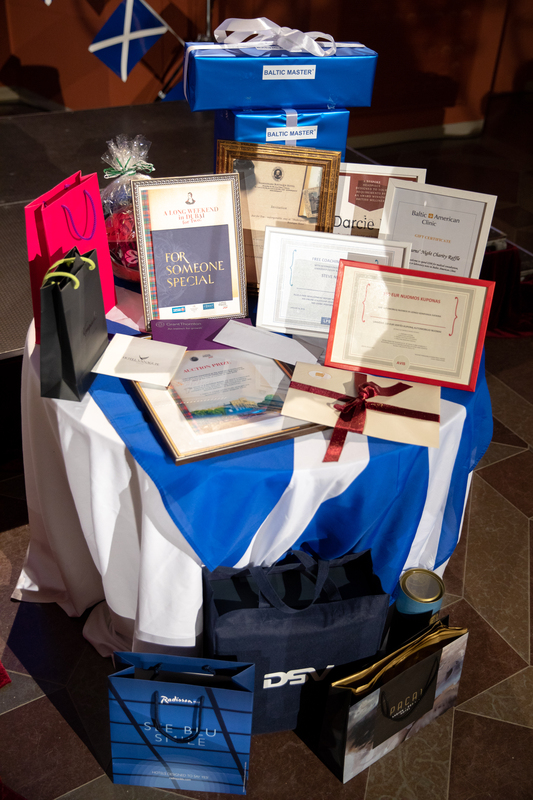 Since 2000, Burns Night in Vilnius raised over 100.000 EUR shared by 24 different children and youth organizations in Lithuania or educational projects related to children or youth. 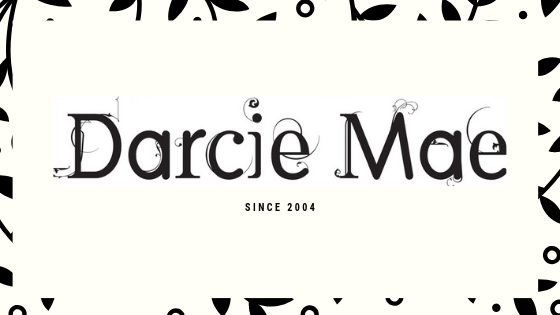 Over 30 companies each year are keen to engage and associate their company name or brand through a variety of Sponsorship tiers and opportunities that exist in relations to this magnificent fundraising Gala. 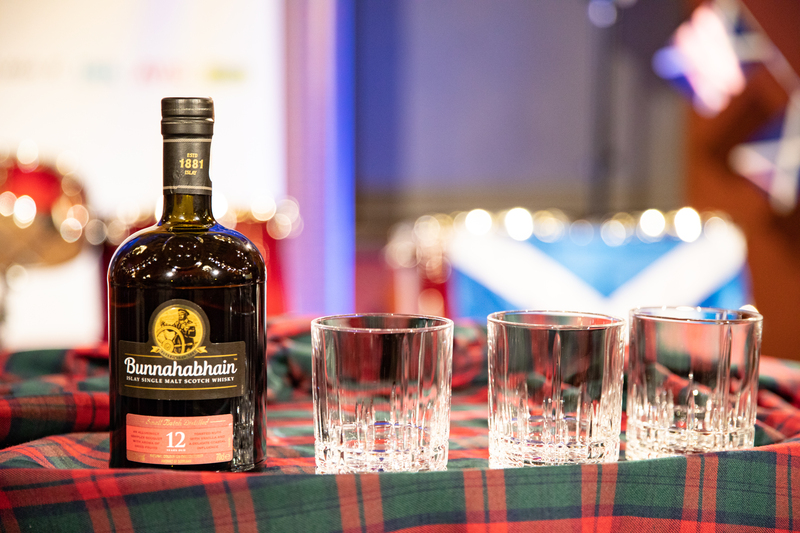 Our team was extremely proud to mark the 20th anniversary of Burns Night in Vilnius, which over the years grew from a small to a magnificent event, where Top British – International and local business come under one roof to enjoy amazing Scottish cultural traditions and raise for the local charities! 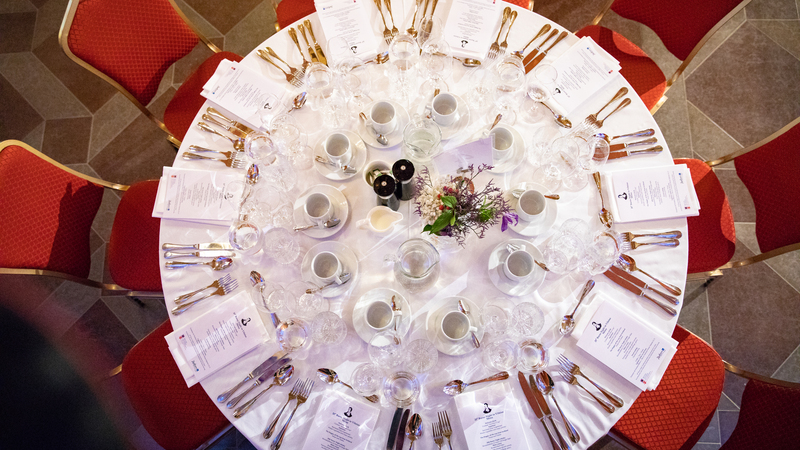 The 4-course sit-down dinner did feature the full Scottish menu, introduced by the Scottish Chef Scott Kennedy and prepared by Gediminas Andriuškevičius, an executive Chef at Radisson Blu Royal Astorija Hotel. (Scottish pudding with fruits and spices, steamed and served with whiskey clotted cream). The guests were welcomed and The Haggis was piped in by Ross French, the distinguished piper from Scotland. The famous R. Burns’s poem ‘Address to a Haggis’ was recited by Graeme Barclay, a Rerr Terr Ceilidh Band member and a manager of music services at South Lanarkshire Council in Scotland. For the stage performance at the Dinner, we were pleased to welcome back SAOR PATROL music band from Central Scotland and Fife, the ancient Celtic Kingdom of Scotland for the 20th Burns Night in Vilnius. Their original pipe tunes and drum rhythms please, and excite audiences around the world, and launch the listener into “Exciting Tribal Experience”. Over 20 years of Burns Nights in Vilnius, this music band managed to gain large numbers of fans among distinguished Burns Night guests. Traditional Scottish Toast to the Lassies were delivered by Nick Price, passionate about life, people and fun. Nick likes to think he had many of the characteristics of Robert Burns but without his talent! 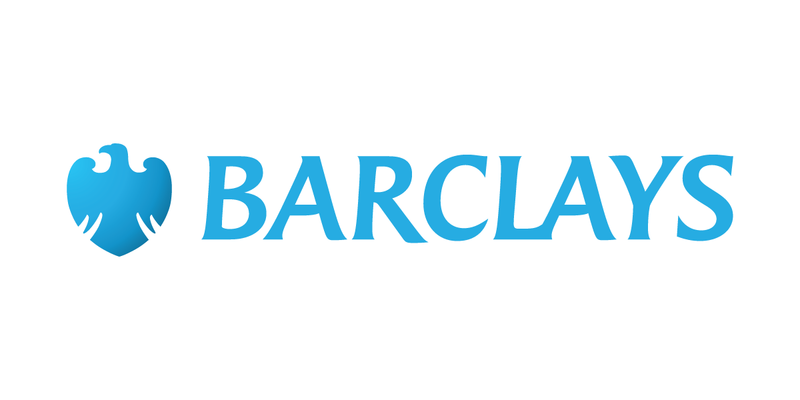 For some time, Nick had his business in Lithuania years ago and was BCCL Board member. 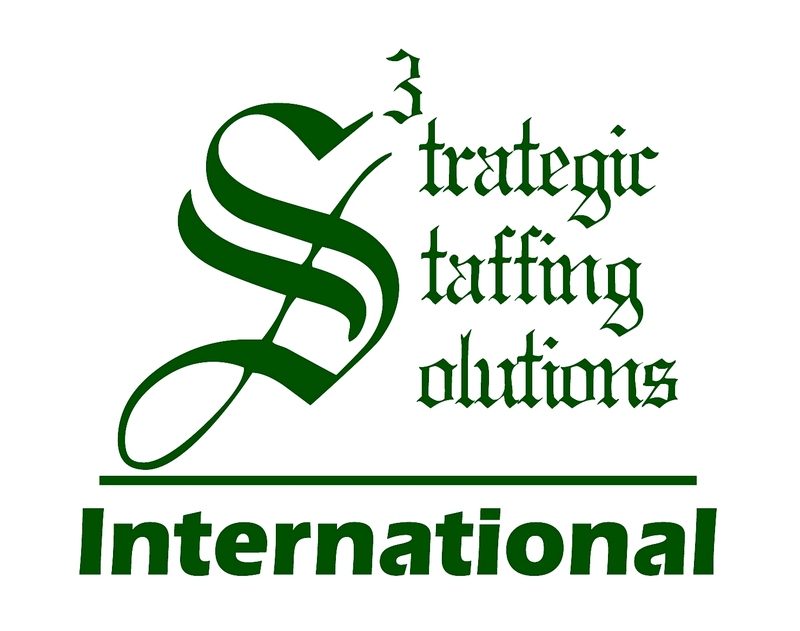 Based in Scotland, he is looking for new opportunities to return and set up a new business in Lithuania. The 20th Burns Night welcomed back Annabel Gaywood, who delivered the Reply from the Lassies. Annabel was born and brought up in Stirlingshire where she learned to love Burns’ poetry, and in particular ‘To a Mouse’, from an early age! The ceilidh band this year – Rerr Terr, which was pleased to return back to Vilnius after 2016 and lead the guests through fantastic ceilidh dances. The band is one of Scotland’s best-loved and in demand ceilidh bands. Rerr Terr was established in 1998 by three good friends and has gone from strength to strength playing regularly at some of Britain’s most prestigious venues for some incredible hosts such as J.K. Rowling, the Duke of Buccleuch and the Marquess of Bute. The trio play accordion, fiddle and drums in a lively and energetic fusion style and just makes people want to get up and dance. 6:30 PM Arrival. Guests are welcomed by Scottish Piper Ross French near a press wall, followed by hot ‘Pimm’s Cup’ cocktail service up stairs near the main dinner hall. Charity raffle tickets are offered for sale. 7:00 PM As the piper marches to the main hall, the announcement is made about the start of 20th Burns Supper in Vilnius. Guests are invited to take seats. 7:15 PM Welcome remarks and Selkirk Grace, said by Chris Butler, Chairman of the BCCL and MC of 20th Burns Night. Red lentil soup is served. 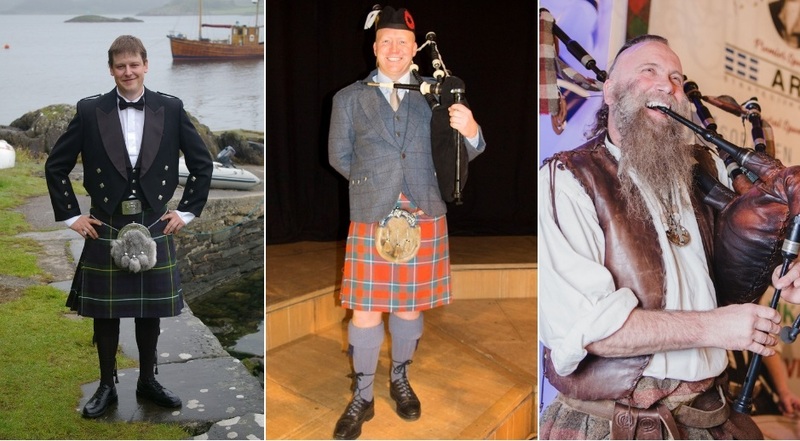 7:45 PM The Haggis is ceremonially piped in and the ‘Address to a Haggis’ is recited by Graeme Barclay. The Haggis is served as 2nd starter. The 1st stage performance by SAOR PATROL – the unique music band from Central Scotland returns for the 4th time to Vilnius to please our distinguished guests and launch all into “Exciting Tribal Experience”. 8:45 PM Main course and dessert are served and followed by the toasts: The Loyal Toast by Claire Lawrence, Her Britannic Majesty's Ambassador; Toast to the Lassies and Reply from the Lassies by Nick Price and Aannabel Gaywood (Scotland); Vote of thanks by Chris Butler, Chairman of the BCCL. 2 nd Stage performance by SAOR PATROL. 9:45 PM Charity raffle and auction start and led by Chris Butler, Chairman of the BCCL, followed by the announcement of raised amount for the charities. 11:00 PM Traditional Scottish dancing led by RERR TERR excellent ceilidh band from Scotland to make your evening even most memorable. Informal party and mingling in the Grand Dukes hall at Grand Hotel Kempinski Vilnius. Complimentary beer is offered for the dancing crowd, cash bar is available for other drinks. 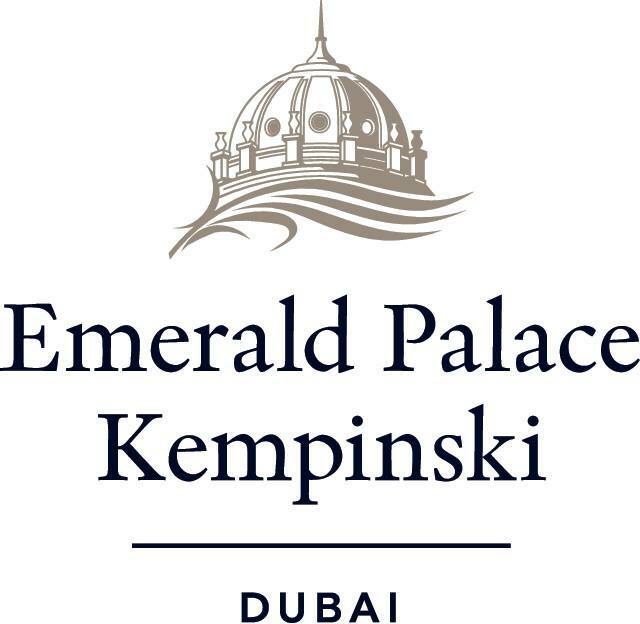 With your Burns Night ticket you will be offered 50% off for a glass of your first drink at Grand Hotel Kempinski. Please provide your ticket in the main hall at the cash bar when purchasing your 1st drink. 1:00 AM The End of ceilidh dancing and informal party in the main hall, but you are invited to move to Bar Le Salon, Grand Hotel Kempinski Vilnius and let the Scottish night to continue! 2:00 AM The End of the End!